The Senate reconvened and resumed consideration of S. 3254, the fiscal year 2013 Defense authorization bill. This morning the Senate rejected an amendment from Sen. Ben Cardin (D-MD) that would direct the Secretary of Defense “to ensure sufficient sizing of the civilian and contract services workforces.” Senators voted unanimously for an amendment from Sen. Bob Mendendez (D-NJ) for more sanctions on Iran. A motion to waive the Budget Act on an amendment from Sen. Bill Nelson (D-FL) concerning annuities for surviving military spouses failed by a vote of 58-34. Yesterday, the Senate unanimously adopted an amendment from Sen. John Cornyn (R-TX) to reduce the backlog of veterans’ benefit claims, and agreed to amendments from Sen. Kay Hagan (D-NC) that would allow the Pentagon to construct a biofuel refinery, from Sen. Jeff Merkley (D-OR) to express the sense of Congress that combat operations in Afghanistan should end by the end of 2014, from Sen. Kirsten Gillibrand (D-NY) to expand TRICARE coverage to cover autism, from Sen. Kelly Ayotte (R-NH) to prohibit the transfer of Gitmo detainees to the US, and from Sen. Dianne Feinstein (D-CA) to prohibit indefinite detention of U.S. citizens or permanent residents apprehended in the U.S. without a charge or trial. The House; reconvened and this morning considered and passed (245 - 139) H.R.6429 — STEM Jobs Act of 2012 which will amend the Immigration and Nationality Act to promote innovation, investment, and research in the United States, to eliminate the diversity immigrant program, and for other purposes. The House moved to speeches by its members and is expected to adjourn until Monday. 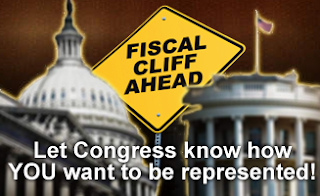 Radio Show Host Kerby Anderson said today, "The so-called “fiscal cliff” is now just a month away and it appears Democrats are becoming less willing to negotiate and are doubling down on their positions. Rather than scheduling meetings with house Republicans to work on a solution, President Obama has gone back on the campaign trail in an effort to create pressure on Republicans to acquiesce to his demands. He has made it clear that he is willing to allow the nation to go over the fiscal cliff if tax rates don’t go up. Earlier this week, Senator Richard Durban, the number two Democrat in the Senate, gave a speech in which he essentially took entitlement and spending reform completely off the table. At the same time, Senate Democrat leader Harry Reid announced that he plans to change the senate rules to eliminate the Republicans ability to filibuster legislation he wants to ram through on a simple majority. A recent poll indicates that 67 percent of Americans expect our elected leaders to act like “spoiled children” in their handling of the fiscal cliff. It’s starting to look like they are right. Republicans are taking most of the blame for the lack of a compromise even though they are the ones actually trying to negotiate. In response to their efforts they are finding a total lack of urgency from the White House and Senate Democrats. According to a report in The Hill, 'A Democratic source close to the negotiations said that the White House 'definitely' sees running out the clock as to its advantage…'"
Tags: US Senate, US House, fiscal cliff, federal spending, obamacare, news, radio hosts, To share or post to your site, click on "Post Link". Please mention / link to the ARRA News Service. Thanks!